NAS 2019 Recognition Day Calendars are here! Have you ever wanted to know the following recognition dates? 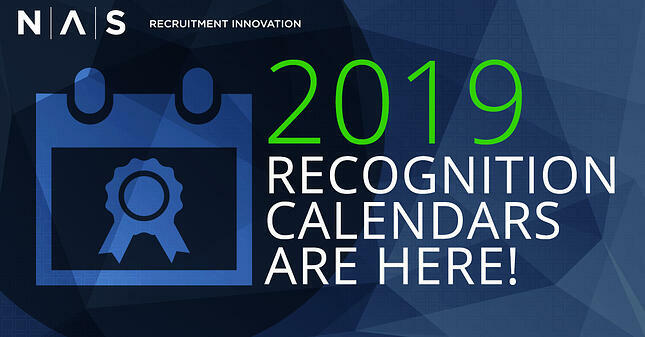 NAS’ Calendars of Recognition Days are our most downloaded offers. Our 2019 calendars feature a comprehensive, 12-month listing of recognition events—including event descriptions and links. The information we include is vast (including all of the above events and much more), and the desire for a one-stop source for a listing of days to honor employees is obviously strong. Enlightened, forward-thinking companies (that’s you) understand that one of the most effective ways to promote employee engagement is through recognition -- and it's handy to have a comprehensive list like ours. Our first calendar features recognition days across all industries, including business, education, healthcare, manufacturing, restaurant, retail, technology and more. Our second calendar includes only healthcare recognition days and is designed specifically for healthcare organizations. Download and enjoy our FREE calendars today! Get your 2018 Calendar of Healthcare Recognition Days! When is National CRNA Week? What about National IV Nurse Day? How will you honor Counseling Awareness Month? Conscientious, forward-thinking companies (that’s you) understand that one of the best ways to improve employee engagement is through incentives, rewards and recognition. That’s why we at NAS take the time to put together an annual listing of healthcare-related recognition events. One of our most popular items, the 2018 Calendar of Healthcare Recognition Days is available now for download.